Custom homes are often designed with wide hallways and spacious transitions between areas in the residence. 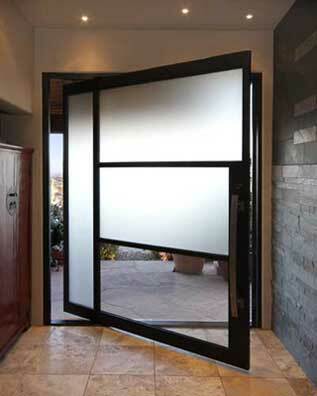 A pivot door is an inviting contemporary solution for replacing traditional sliding glass doors. Double door entrances are being replaced with eye-catching pivot doors in homes, luxury apartment complexes, spas and salons, high end restaurants and office buildings to create a dramatic modern entrance. The pivot door can be a surprising change to transform your office lobby, conference room, or entertainment area. Pivot doors require a larger opening and are ideal for oversize entrances. Many pivot door designs can be installed to replace old style double doors. The pivot door requires adequate space for a portion of the door to swing and pass through. You will find a wide selection of pivot doors on the internet through online retailers. High-end door manufacturers, such as Portella Iron Doors, offer unique contemporary and modern doors that complement an office space or residential home. The Portella Pivot Door offers a unique and innovative custom entrance, featuring an elegant opening system that opens and closes with a gentle touch. Physicians looking for elegant solutions that offer privacy in a waiting area or private room can install a pivot door with frosted glass to create a feeling of luxury and openness yet provide privacy for patients. A restaurant with private dining rooms can create a similar welcoming feeling while affording privacy for a business lunch, networking event or dinner party. By installing a modern pivot door in a spa or salon, the space creates clear transitions from one area to another. Pivot doors are typically designed to open with a gentle touch and are quieter than using traditional doorknobs that turn and latch. A serene atmosphere is created in salons and spas that utilize pivot doors to complement a tranquil environment. The executive conference room is transformed from ordinary to chic with a modern pivot door that may feature frosted glass for privacy or clear glass for transparency within an organization. Typically, pivot doors will range in size from 4’ to 6’ in width, and may be as tall as 10’ or higher. Portella Iron Doors offers a custom pivot hardware system for smooth opening and closing. The key feature of a pivot door is the location of the offset hinge. A traditional door hinge is located on the left or right edge of the door and jamb. The pivot door uses a hinge, located at the top and bottom of the door, a spindle that connects to a reinforced portion of the top jamb, and a concealed box that is mounted into the floor and reinforced threshold. Since the pivot door is oversized, it creates larger openings for sizeable items to pass through the framework. This makes the pivot door suitable for industrial use and commercial businesses. Pivot doors may be made of metal or a combination of glass with a metal framework. Installing a pivot door is best performed by an experienced installation team. Trained professionals may need to remove a portion of the flooring to accommodate the pivot box. Once the box is positioned and set with quick cure concrete, it is then concealed with the custom reinforced threshold system. Technology advances in custom door design and hinge systems will continue to translate into well-designed options for businesses and homeowners. Contact us for a free brochure and to learn more about innovative pivot door solutions.